It will also work with any development language that allows the user to drop an ActiveX control on the window. The control manages text boxes, text strings, RTF-Control and finaly the TX Text Control (www.textcontrol.de). 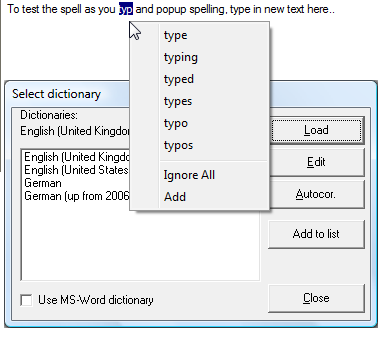 You can spell check single words, selected text or a complete document. -built in spell check dialog box with ignore and add word feature. -built in choose wordbook dialog. -supports user dictionaries and can use the dictionaries of MS-Word. -supports ignore words, and change all feature. -can place on Web pages to check the spelling of text entered into Internet Explorer forms. Smart PPT Converter 12.4: Convert PowerPoint to video - AVI, MPEG and more. Convert PPT to video files. IconLover 5.45: Icon editor to make icons, manage icon collections. Made with love! Smart PDF Creator 14.4: You can batch convert all your printable documents to PDF format fast and easy. Soft4Boost Audio Studio 5.1.9.241: Edit your audio collection with Soft4Boost Audio Studio.